Climate change is a serious risk to vulnerable communities. Six of the eight threats recently highlighted by a team of scientists that gathered in Japan are being addressed by South Africa’s EduPlant programme. Severe weather events, such as those experienced in late summer this year, can destroy crops and lead to hunger and famine. 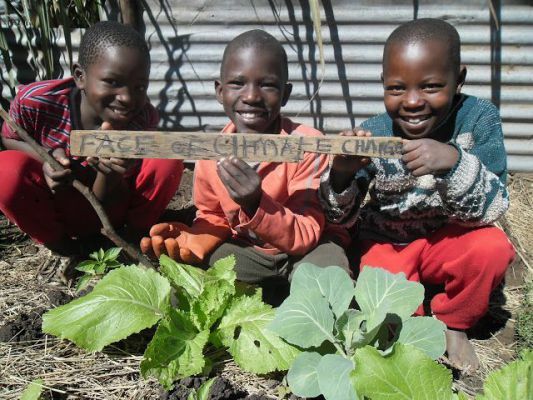 Schools that apply Permaculture principles are better able to withstand such events and maintain food security, and help to prevent debilitating nutritional deficiencies such as kwashiorkor. Long term droughts can be mitigated by planting trees and using innovative methods such as grey water harvesting; this is particularly important for the western parts of South Africa, where small changes in weather patterns can have devastating consequences. For two decades the EduPlant team has supported the development of sustainable food gardens and greening. EduPlant has helped schools and their surrounding communities to create abundant gardens with year-round harvests using permaculture practices. “EduPlant, initiated in 1994, is part of Food & Trees for Africa’s solution to global climate change and food security. We are now calling on schools to submit their entries into this year’s competition, to share with us their innovations and achievements in their school food gardens,” says Joanne Carty, EduPlant Programme Manager. Part of the incentive to encourage schools to excel is the biennial EduPlant competition and entries for 2014 are closing at the end of May. The winners of this year’s competition will be able to send one educator on a two-week course that will provide vital skills to build on their schools’ successes and enable them to cascade their skills to the surrounding community. 60 finalist schools stand to win a total of R 275 000 in cash prizes as well as tools and educational resources. The Woolworths Trust and Engen support the EduPlant programme in order to build robust communities. The entry form can be downloaded at http://www.trees.co.za/programmes/eduplant. Follow the progress of EduPlant schools on Facebook https://www.facebook.com/EduPlant or twitter @EduPlantSA.